Theres no easier and better way to get started on electric bass than this electrifying Squier set. 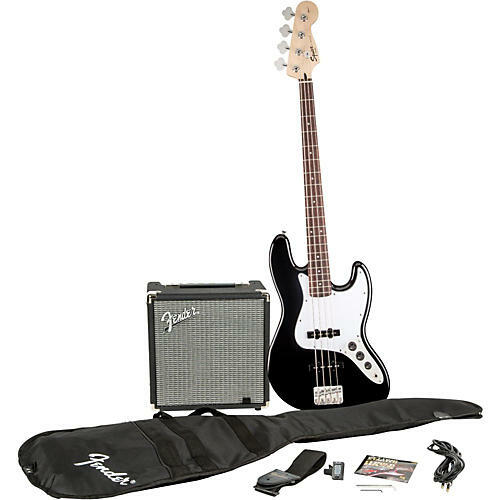 Opening the box opens your musical future, with a sleek and powerful Affinity Series Jazz Bass and great-sounding 15-watt Fender Rumble 15 amp to plug it into, and all the accessories you need, including an instructional DVD, electronic tuner, gig bag, cable and strap. With its sleek design and powerhouse tone, the Jazz Bass is the longtime favorite of bass players everywhere. Its a must-have instrument prized for the smooth feel of its slender neck and the versatile voice of its dual pickups and the Squier Affinity Series Jazz Bass in this pack delivers top sound, style and value. The Fender Rumble 15 combo is the perfect at-home practice amp for bass players everywhere. With 15 watts of power, a sturdy 8 speaker, easy-to-use controls and a rugged enclosure, it delivers pure Fender bass tone with terrific performance and portability. You get the bass guitar, the amp, the accessories and instructions all in one package. More than ever, its everything you need to Stop Dreaming and Start Playing!